Sometimes two rights make a wrong. Recycled, reused or repurposed building materials can conflict with other environmental initiatives. For instance, many green buildings are extremely energy-efficient, in part because of new synthetic materials that provide greater insulation and strength than traditional materials. The reuse of old materials can reduce stress on the environment, but at what cost? Is it better to reuse old, drafty lead-tinted windows or simply manufacture new ones? Wooden beams may retain their structural integrity, but what if they are contaminated with lead paint? Recycled or repurposed building materials must be closely examined before they can be used in new construction projects. 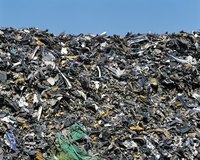 In their article on issues with recycled materials, Charles J. Kibert and Jennifer L. Languell note that "sorting and processing construction waste materials leaves little room for improvement. Debris in the mixed state requires tedious and labor-intensive separation." As a result, governments must often provide subsidies for recycling efforts to make material salvage cost-effective. However, they note that government subsidies often support the extraction of virgin materials as well. Better methods are needed to separate, sort and store potential building materials before they are lost to the landfill. Thousands of condemned buildings are demolished each year. Much of the wood from these demolition sites are still structurally viable, but at times they contain contaminants, such as lead paint, that make them difficult to reuse for new building products. The U.S. Department of Agriculture released a report on lead-polluted wood products in 2005, detailing the difficulties in repurposing this material, as the Occupational Safety and Health Administration has strict guidelines prohibiting worker contact with lead paints, in addition to restrictions of lead in consumer products. According to the report, "much of this material would be valuable were it not for lead-based paint. In addition to wasting potentially valuable resources, the practice increases the landfill burden and the stress on natural systems." Efforts to improve the environment can sometimes come into conflict. For instance, reusing building materials may reduce the stress on natural habitats, but some materials don't meet current standards for energy efficiency. As Kibert and Languell point out, "the sale of salvaged windows may not have the same energy efficiency of new windows and may carry other detrimental environmental effects," such as lead-tinted glass. New building projects and concerns about health issues often expedite the demolition of condemned buildings. However, the wrecking ball is not known for having a gentle touch. Many of the materials in these buildings must be carefully salvaged for reuse. Kibert and Languell note that "the demolition contractor is often contacted by the project owner and is under a time constraint requiring construction to begin in a matter of days. This time constraint will not allow for the deconstruction process to occur." The additional labor required to carefully deconstruct these buildings may offset the savings gained by using repurposed materials.